Forget presents and eggnog–our favorite thing about the holidays is Christmas baking! 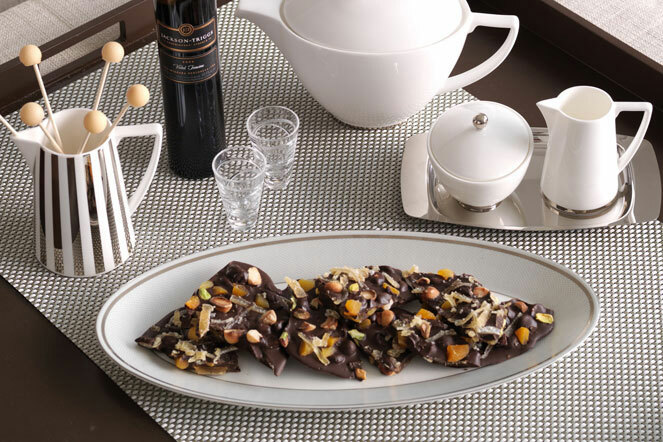 Add a homemade touch to your gift-giving this year and treat your friends and family to packages of chocolate bark. Break the bark into pieces and place them a cellophane bag tied with a festive ribbon and you’ve got yourself the perfect hostess gift. Or, place chunks of bark in decorative bowls for guests to enjoy at your holiday gathering. Everyone who tastes this treat will rejoice at the amazing combination created by chunks of crystallized ginger and salty nuts. Yum, yum! Line small baking sheet with foil. Melt chocolate chips in medium bowl over saucepan of simmering water, stirring constantly, until smooth. Pour melted chocolate onto foil, spreading with spatula until approximately 2/3 cm (1/4 in.) thick. Scatter nuts and apricots over chocolate. Sprinkle with ginger and salt. Chill until chocolate is firm, about 30 minutes. Peel off foil. Break bark into irregular pieces.